February 5, 2016: Not much done on the mini house for the last couple of days – until today. At lunchtime I worked on getting the floor in for the second floor of the house. Which is funny, because working on the floor didn’t actually involve touching the piece of wood which is going to be the floor, LOL! I decided that the easiest way for me to get the floor installed level and without severe frustration (having only two hands and one body) was to cut two wall pieces. 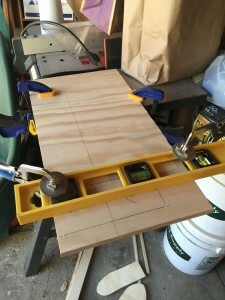 The idea is to cut the walls and then clamp them to the inside surface of the walls, and then use them to support the floor while I screw it in. But there are always challenges. I had trouble with my saw, finally figured out the nut was a bit loose. Also using my circular saw cutting jig was a pain because these walls are smaller pieces and I have not gotten around to making myself some smaller jigs. The one I am using is 48” long. Need I say more. Hmph. Well, whatever. I made it happen, and the pieces are cut. By that time, lunch was over, so nothing more today except watching a few you tube videos of some modern dollhouses. I worked a pretty long day today too. And made dinner. I think I’m too tired to say much more tonight. I do want to comment that I can already tell I am going to continually have to rein in my tendency to perfectionism. I am not a full on perfectionist, but it is pretty ingrained in me to try to do as good a job as possible in whatever I do. I rarely attain perfection but I suppose I am always striving for it, sometimes a little too hard. It is hard work for me to try to balance out time and finance issues with the effect I am trying to create. I have to second guess myself about what will be too much to take on. I don’t really have a time limit on this house, but I don’t want to spend ten years completing one house, either. So I’ll have to take a breath and determine which items I really need to purchase instead of making them, what I don’t have the equipment to pull off, etc. Bathtub. Definitely buying the bathtub, probably off Shapeways. That is going to be a centerpiece for my bathroom. It has to be as close to perfect as I can get. There are definitely specific things I want to make. For instance, I really want the fireplace and some of the house exterior to be stacked stone – REAL stacked stone. I will have to work out if I can afford the equipment I will need to cut down the 12 x 12 web backed stone tiles to the right scale. And I want to make the kitchen – ALL the fittings, but not necessarily food or dishes. I am planning on purchasing wood veneer for the cabinetry, and probably will make “marble” or “granite” or maybe “quartz” countertops. I also want to make the appliances. The stove, ovens and dishwasher should not be too difficult, as I can use veneer stainless steel from the hobby store for those. One of the things I can see from my online research is that the mini kitchens usually suffer from scale issues that mostly are caused by failure on the part of the makers to measure actual cabinets so that their miniatures have realistic proportions within the piece so that the item parts as well as the adjacent pieces are properly related to each other. When I say “scale issues”, I mean that when you look at the photos of the kitchens, they tend to look “wrong” and obviously miniature, rather than almost real. There are certainly exceptions to this and I do want my kitchen to also be the exception in this area. As I fine artist student, one of the things I learned is how important it is that the parts of an art piece relate to each other, and size is a large part of that relationship. This principle also applies to the Art of Design (of furniture or buildings) because the parts of an item of furniture or the parts of a building need to relate properly with each other for both practical and aesthetic reasons. Practically, we don’t want the item or building to break or fall down, leak or have any other practical downsides. Aesthetically, we want something to look beautiful or striking or impressive, or some other positive adjective, and not “off” or unattractive or boring. So the scale issues I’ve seen with miniatures most often seem to be caused by errors in (or possibly just not being all that concerned about) scale or relationship within the parts of the item. Frames slightly too thick. Width of a cabinet out of proportion with depth and height. Now, I’m a beginner in this. But I’m hoping that a good eye for physics, natural handiness and good mechanical ability will help me do a creditable job on my first attempt. And I will mention right here that stubborn persistence and willingness to make corrections or start over probably won’t hurt. Well, I haven’t worked on the dollhouse physically since the last post on 1/31/16. I work long days and it is hard to get any time to do work on the house, some days more than others. Besides, I’ve still got a lot of studying to do so that I can pull this off. I’m a detail-oriented person and for a person like that, the internet is an irresistible magnet of information and learning. So I’m looking at miniature building tutorials for both furniture and housing, and since one of the critical things I learned from using the Live Interior 3d Standard program to design my house is that I actually need to know at least approximately what furniture and where it goes in the house before I get too far into the building process, I’m now working on viewing videos of dollhouse lighting. Armed with what I’ve already learned from some of the mini modern dollhouse websites, I’ve realized that to get my lighting in place, I am going to need to go with a slightly dropped ceiling. Why? Well remember when watching all those HGTV shows how the designers have to get the electrical contractors in to move electrical lights around, install under cabinet lighting, and such? Yeah, that. So either I build my mini house the way people build homes for real peeps and finish the whole thing first, and then do a bunch of remodeling, or I do the basic design NOW, and just do it once. Oh, guess which one I picked, hahah! I saw a dropped ceiling with electrical wiring in the ceiling on one of the websites – LOVE that idea! I have high ceilings in my dollhouse (10 inches) so I can afford a ¼ inch or even a ½ inch dropped ceiling to allow me to install the electrical. I could even afford a hollow wall if needed. But I’m still learning, so I’m not yet sure what the best way is to deal with the walls, especially since I won’t be having wallpaper. I may simply use a layer of matt or posterboard over the walls to cover electrical and use the tape system for the walls. We’ll see. But the reason I really like the dropped ceiling, particularly for the downstairs open concept living area, is that there is going to be a multitude of electrical at the ceiling area. There will be can lights in the living room and the kitchen area, and possibly the dining room. There will be pendant lights above the island in the kitchen, and a chandelier above the dining table. For the greatroom walls I will need multiple outlets for the table lamps in the living room, and an electrical connection for the glowing fireplace. There will be undercabinet lighting in the kitchen. I already have tiny LED strips for under the cabinets! In the 2 story foyer/stairwell area there will be some dramatic lighting of some sort including a long chain “chandelier” which will have lights in it. Upstairs there are only two rooms, bathroom and bedroom, but the bedroom needs wall outlets for lamps and probably some sort of modern chandelier or ceiling fixture. The bathroom probably doesn’t need a ceiling fixture but it may need lighting at the ceiling of the shower, a vanity lighting setup and a few can lights. Even the roof will need lighting. There will be landscape lighting for the plantings, area lighting for the deck areas, and probably a light used for the outdoor firepit or fireplace (whichever I decide to go with). What about the front of the house, where people put porch lights, etc? Hmmm….for me, this is a very different issue. Most dollhouses have the front of the house permanently attached with the “back” of the house open. Well I live in a large, dusty metropolitan area, and my dollhouse is somewhat bulky and heavy, so turning it around to see the front, or having only 3 sides to it, just not gonna work for me! So my house is the opposite from most dollhouses, and the BACK is permanently installed with the front being removable. I have not yet decided how it will fasten on yet….been thinking on that for a bit, have come up with various ideas. It would be possible to electrify the front exterior lights on a tape system but I’d have to plug the exterior light in after putting the front on if I do that. So really, any exterior lights really need to be battery operated. BUT, I want something really cool and modern, so I may have to purchase a battery operated fixture and then hack it into a modern fixture. Ought to be FUN! In between actually working on the physical house I am studying blogs, videos, tutorials, and catalogs trying to learn about how best to create, build, sequence, furnish and accessorize my mini house. So that’s what I’ve been doing on 2/2/16 and 2/3/16 along with ordering some mini stuff, supplies, lovely things, etc. that I must order now or risk losing. Ordered some velour paper for printing area rugs. Looking forward to trying that out! 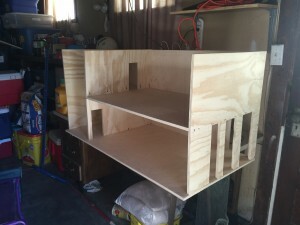 Well I’ve already started my dollhouse, but I’m finally getting around to starting my blog. Until I got a web page up, it was a Word document diary only. Oh well…and I still have to work on my Texas adjuster licensing and until I pass that test, there won’t be a lot of entries in here anyway. 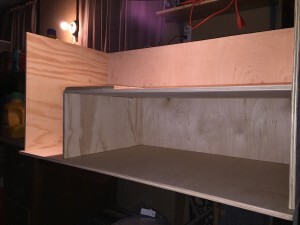 I thought about doing a hack of a bookcase for my first dollhouse. And who knows, it might be my only dollhouse. But that wasn’t what I wanted – I wanted to build it all myself. I don’t mind not making all the furnishings but I want to build the entire house myself. My funds are limited and this dollhouse will likely take a long time– I estimate it will take 2-3 years to final completion based on limited time and funds, and the fact that I do plan to make the house itself and as many of the furnishings as I can manage. I actually purchased an app to help me design the house. I thought it would take much longer to try to draw the house out by hand, but partly I really wanted to see it more in 3d than just 2d. It turns out this program (Live Interior 3D Standard) was a real money and time saver. I figure at the very least it saved me from spending more on replacing wasted plywood than the program itself cost! I’m also very glad that I “furnished” my virtual dollhouse using Live Interior 3d, because it caused me to rethink some of the dimensions I had been playing with. The virtual furniture is not quite what I plan to use, but I did pick things that were at least going in the direction of the modern miniature style that I like. And it really made the placement of the furniture very real to me, especially placing objects in the 3d view. This program is pretty cool as it has 2d and 3d views and one can place objects in both views. Due to the 3d view I actually made some significant changes in the sizing and design of the house, because I could get a pretty good idea of how things would actually look. I would really have enjoyed getting Live Interior 3d Professional. The choices in furniture, windows, etc. in the 3d Standard are pretty basic. But for my purposes the extra cost really isn’t justified. And it really doesn’t matter what kind of windows I have in the Virtual House because I can construct the windows in my Actual House in any way I choose. So as I mentioned before, this is going to be a modern dollhouse. No Victorian or farmhouse minis for me. I used to like that sort of thing more, though I’d say I leaned more towards slightly older styles than Victorian. But I’m done with that. I really like the modern minis now. And there’s so much online! I am pretty sure I could surf the net for a couple of years and not get to every mini site. Even the modern minis, which constitute by far the smaller percentage of the available information, constitute tons of web pages and websites. So working on a mini house is a lot easier for me than working on a people sized house. Not that it’s always easy, however. I started the dollhouse before I started the blog, so it’s already moved from the virtual universe to the physical universe, yay! So remember, as I mentioned above, I live in a tiny house. It is under 900 square feet, with two smallish bedrooms, one bath and a bonus room (which we use as laundry room, office and storage. That means I have really, really limited space for a dollhouse, so it can’t be very large. Now, I really liked the Brinca Dada dollhouses, and Chris Barret’s contemporary dollhouse (http://modernminihouses.blogspot.com/2013/06/chris-barretts-contemporary-beach-house.html); as well as the MiPad miniature house. But some of these are completely impractical for my space considerations, and given the fact that I really only have ONE yes, that’s right, ONE, place in my house to put a dollhouse, I really have to go with more of a bookcase style. But – not as shallow as a bookcase normally is. That would just not give me enough room. So, the laws of physics in my office/guest room mean the dollhouse can’t be more than about 40 inches long. There’s an air conditioner in the window that the dollhouse will sit under, so it can’t be more than about 26 inches high. And it can’t stick out too far because I have to fit my office chair in the nearby space because yes, working at home, so not much more than 20 inches deep. The foregoing is why my dollhouse is a 42 inch by 21 inch box. Okay, the box part is also caused by the modern style of it, which involves a flat roof. It’s two floors, with a two-story stairway/foyer hall, and the stairs go all the way up to the roof. One of the wonderful things about dollhouses vs real houses is that I don’t have to care about rain getting into the house through the stairwell to the roof, so I can just leave it open if I want. Nope, it won’t be raining in my office, LOL! Guess the dollhouse will be fine. Oh, and I don’t have to use any space for a closet, nor do I have to have a powder room for guests. Ah, the freedom for me to have just the spaces and functions that I want to concentrate on. So, only ONE bedroom. But, a HUUUUUUGE bathroom, oh yeah! I am practically salivating over the bathroom. I found a tutorial where marble countertops were constructed by covering wood countertops with printed out photographs of actual marble, decoupaged on with Mod Podge. They look sooooo real! I also found some amazing marble, granite and quartz countertop photos which I saved, and can hardly wait to start experimenting. Of course, I could use this for the kitchen, too. And there’s a lovely bathtub I saw at Marian Russek’s Spaceways shop that I want to use. The shower design and construction is going to be way fun also. It’s going to be hard to restrain myself but I do plan on doing what is best for the overall design. Another thing I am really looking forward to is Art for the mini house. I am a fine artist, and I am thinking about trying some miniature paintings. But there are also many fine artists whose work I enjoy, and so I think just deciding may be tough! And considering that I don’t really like modern art as much as I like modern design, we’ll just have to see how things morph with this issue. I also want to work in my love of creating with found objects and repurposing. There’s a lot to fit in to what I want to create. Time for bed, gotta get up and adjust some claims tomorrow, cuz I like eating, living indoors and oh yes, building miniatures (yep, need money for that, too). Here’s a picture of the beginning of the process of cutting a door opening in the downstairs interior wall. The level is clamped to the piece at a place that allows it to be used as a jigsaw jig so that I can get a straight cut. Hello world! Welcome to my modern mini house construction blog. I started my “blog” in Word before I had a website. So I’ll be adding posts with the date actually written, until I get up to the present date. 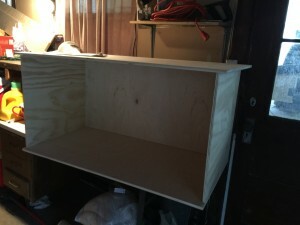 This blog has been set up primarily so that family and friends can follow how I am doing with my dollhouse construction. Of course, anyone else who loves modern miniatures is welcome to visit as well. I hope you all enjoy yourselves! Author minisu5_wpPosted on February 19, 2016 February 21, 2016 Leave a comment on Hello world! Welcome to my modern mini house construction blog.